Joe Dorish Sports: What State in the United States has the Most College Football Teams? What State in the United States has the Most College Football Teams? Do you know which state in the United States has the most FBS college football teams? If you live in the state you probably know but most Americans might guess another state and not too many people will guess the 2nd state correctly. In any case, this article answers the question which state in the United States has the most college football teams (FBS). A few notes first. There are 130 FBS college football teams in the United States. There are only 9 states in the United States that do not have at least one FBS college football team - Alaska, Delaware, Maine, Montana, New Hampshire, North Dakota, Rhode Island, South Dakota and Vermont. Those 9 states are ranked from 41st to 49th in population. The 50th ranked state for population is Wyoming which has a FBS college football team (the Cowboys play in the Mountain West). The state of Texas easily leads the country with 12 FBS college football teams. Texas, TCU, Baylor and Texas Tech all play in the Big 12. SMU and Houston both play in the AAC. 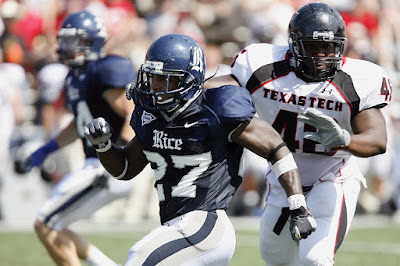 North Texas, Rice, UTEP and UT at San Antonio all play in Conference USA. Texas A&M plays in the SEC and Texas State plays in the Sun Belt Conference. Believe it or not but Ohio is in 2nd place with 8 FBS college football teams. That's mainly because of the MAC Conference where Ohio, Toledo, Akron, Bowling Green, Miami of Ohio and Kent State all play. The seventh and eighth teams from Ohio are Cincinnati in the AAC and, of course, Ohio State in the Big Ten. No shock Florida is on the list. UCF and South Florida both play in the AAC. Florida State and Miami both play in the ACC. Florida Atlantic and Florida International both play in Conference USA and the University of Florida Gators play in the SEC. No shock California is on the list either. Stanford, Cal, UCLA and USC (which is a private college not public) all play in the PAC-12, while San Diego State, San Jose State and Fresno State all play in the Mountain West Conference. Did you guess North Carolina would be on the list? Duke, NC State, Wake Forest and the University of North Carolina Tar Heels all play in the ACC. East Carolina plays in the AAC. Charlotte plays in Conference USA and rounding out the North Carolina teams is Appalachian State which plays in the Sun Belt Conference. If you guessed all five states you really know your college football. And if you knew Ohio has the 2nd most teams you are a college football genius. The answer to the other trivia question above, which two top 20 populated states only have one FBS college football team each are New Jersey and Wisconsin. Rutgers is in New Jersey, which has the 11th largest population, while the University of Wisconsin is the only FBS team in Wisconsin which has the 20th largest population in the USA. Average Salaries of College Football Coaches in the ACC, Big Ten, SEC, Big 12, PAC-12 in 2017?